UNSW researchers are recruiting for a study that could reveal the drivers of aggression in boys, opening up new treatments to stem violent offenders in future generations. The researchers are using the latest in brain scanning technology to explore distinct and different causes of aggressive and anti-social behaviour, each with different neurological pathways, in boys aged 8-16. Professor of Psychology Mark Dadds, director of the UNSW Child Behaviour Research Clinic, says combative boys appear to fall into two groups – emotional-impulsive personalities who are overwhelmed and likely to lash out (they are referred to as ‘hyperstimulated’) and the more callous or ‘cold-blooded’ subtype. “But there is evidence of another group who simply are not registering you and I as having emotions, who operate in a world where everything is just an object. Instead of being oversensitive they are completely ignoring the signs of other people, and their violent behavior can be more cold-blooded,” he says. The current study, led by UNSW Professor of Psychiatry Rhoshel Lenroot in collaboration with Professor Dadds, is using eye-tracking technology to see how brain activity differs between these two groups of violent youngsters when they look at people with varying facial expressions, and if their brain activity changes if they are explicitly told what facial cues to look at. Previous research has shown that callous children tend to not look at the eyes when shown images of emotional faces, which means they may miss vital emotional cues. When explicitly instructed to look at the eyes Professor Dadds’ previous work found the boys with more callous traits would correctly identify the emotion, indicating a potential area for early intervention with behavioural therapy. “Part of what’s going on may actually be problems with the formation of attention and the way that those attentional systems are driving what they key into in the environment,” says Professor Lenroot, who is also a Research Fellow based at Neuroscience Research Australia (NeuRA). A part of the brain called the amygdala, which processes external threats, is of particular interest. Previous studies have suggested it is likely to be overactive in the emotional-impulsive boys and underdeveloped in the ones with more callous behaviours. Subjects’ emotional reactions to different facial expressions will also be measured by tracking a range of physiological measures such as how dilated or constricted the pupils are, heartrate, and how fast someone is breathing. These measures are then matched to their brain scans. Childhood aggression can be one of the first indicators of behavioural and psychological problems later in life. But Professor Dadds says children who tend to show different types of aggression will respond to different kinds of treatment, making proper diagnosis and management critical. “If you think of those one-punch guys, many of them have been emotional-impulsive all their lives. They walk down the street thinking people are trying to fight them and seriously believe people are giving them looks. “But there’s also a group in there who perceive someone’s knocked them and don’t even see them as human.They’ll just punch you to get you out of the way,” he says. The study is being funded by an NHMRC Project Grant. September 3, 2014 - A new study led by a PhD researcher at The University of Western Australia has revealed that parts of the iconic Galapagos Islands have been overrun by invasive plants from other parts of the world. "People may be shocked that a place considered so iconic for biodiversity is so overrun with weeds in some areas despite ongoing control effort by National Park rangers, but this is really a global story," lead author from the UWA School of Plant Biology Mandy Trueman said. The results published in the open access journal Neobiota confirm that in the humid highland part of Santa Cruz Island in the Galapagos National Park, nearly half of the canopy of the vegetation is composed of non-native trees, shrubs and grasses. "These invaders compete with native plants for light and water and can change the environment so that both flora and fauna are affected," Mandy said. "These invasions are one of the factors threatening Galapagos species, many of which occur nowhere else in the world." The core outcome from the study is a map and associated database that details the abundance of both introduced and native species over the landscape. This information is of great importance to managers. The Ministry of Environment through the Galapagos National Park Directorate, within the introduced and invasive species control program has made great efforts to control invasive species and replace them with natives. These efforts have resulted in the recovery of some areas of high ecological value. They annually manage 400 hectares per year for the worst invaders -- blackberry, guava and cedrela. Also endemic plants propagated in the nursery of the Galapagos National Park are used by park rangers for reforestation. The Galapagos National Park Directorate has also initiated studies into potential biological control agents for blackberry, which is considered the worst invader. Heinke Jäger, who is based in Galapagos with the Charles Darwin Foundation, explained the importance of knowing where different plant invasions have occurred so that decisions can be made about how to manage them. "The reality is that humans take plants to new places and that can change the nature of those places forever. Islands are particularly susceptible to these changes," Heinke said. "Eventually some native species will lose out against the non-native invaders. This is a reality that conservation managers in many parts of the world need to deal with." "It was a real privilege to spend all that time walking in the highlands in the company of giant tortoises, getting to know the Galapagos plants," Mandy said. "There are still a lot of native species present, and I hope this study can help managers decide where to take action to protect our precious native flora and fauna." 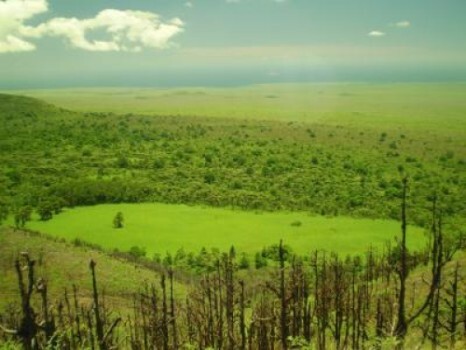 Photo: This landscape was taken looking NW from the summit of Santa Cruz Island, showing some native vegetation (foreground), a patch of invasive elephant grass, native Scalesia forest invaded with several species (behind the grass patch), and invasive Avocado forest (behind grass, a dark patch on the left). For decades Australians have seen health care in the United States as the archetypal example of how not to do it. So it's ironic we now find ourselves looking with admiration at major, holistic reform efforts under the Affordable Care Act (otherwise known as Obamacare) even as the Abbott government seems hell bent on adopting the very approaches the US has abandoned. Clearly there are lessons to draw from this situation. Among developed countries, the US is the outlier in terms of returns on its investment in health care - no other country spends more as a percentage of gross domestic product (GDP) or per head of population for a mediocre return asmeasured by infant mortality, life expectancy and disability-adjusted life years. America's health care is funded and delivered through a variety of mechanisms. These range from the epitome of socialised medicine (Veterans' Affairs), to the commercial market where health funds have been allowed to set their own rates and determine who they will cover and the extent of that coverage, using rulings based on profit margins rather than patients' needs. Reference pricing, bundled payment mechanisms, strong reporting requirements and widespread transparency of both public and private data collections are helping to drive down prices, reward quality, and increase public awareness of inappropriate variations. And it's working: growth in bothhealth insurance and in overall health care costs is slowing. The most egregious back-step by the Australian government is in the area of prevention, despite international recognition that the only way to make a sustainable impact on health outcomes and health-care costs is through major investments in prevention and public health. The 2014-15 budgethas seen the dismantling of the Australian National Preventive Health Agency and the scrapping of the National Partnership Agreement on Preventive Health, ripping A$377 million from programs that were addressing alcohol, tobacco and obesity. In contrast, Obamacare is making substantial investments in this area. The law ensures that there are no co-payments or deductibles for preventive services, boosts the public health workforce, establishes a $15 billion Prevention and Public Health Fund, and - most innovatively - establishes the National Prevention Council to make health and well-being a whole-of-government responsibility. The federal government is leading in these efforts with financial incentives to encourage communities and the private sector to get engaged. The success of this concerted approach is demonstrated by data showing that slowly but surely the US is making inroads in tackling the obesity epidemic, while obesity rates in Australia continue to climb. The consequence is that Australian health care costs will continue to grow along with Australians' waistlines. Also, US data highlights how investments in workplace wellness reduce sick leave, workers' compensation and medical costs. Australia has a health care system that, despite its problems, delivers excellent value for taxpayers. But it is in need of serious reforms - based on evidence not ideology - to reduce fragmentation, address inequalities, and provide the services we need for the health problems of the 21st century. A compilation film on Sir Ian Clunies Ross produced for the Ian Clunies Ross Memorial Foundation. On Merchant Navy Day (September 3rd), we remember the largely unsung heroes of war, the Australian Defence Force personnel and civilian seamen who served in Merchant Navies across the world. Their service during the Second World War is especially significant today as we also mark the 75th anniversary of the start of Australia’s involvement in the war. On 3 September 1939, following Great Britain’s declaration of war on Germany, then Prime Minister Robert Menzies was heard on every national and commercial radio station across Australia declaring that we too were at war. The Merchant Navy was made up of commercial vessels, assembled as part of the war effort to act as hospital ships, carry supplies and patrol our waters. Their job was perilous, often carrying valuable cargo and ferrying troops to and from warzones around the world. 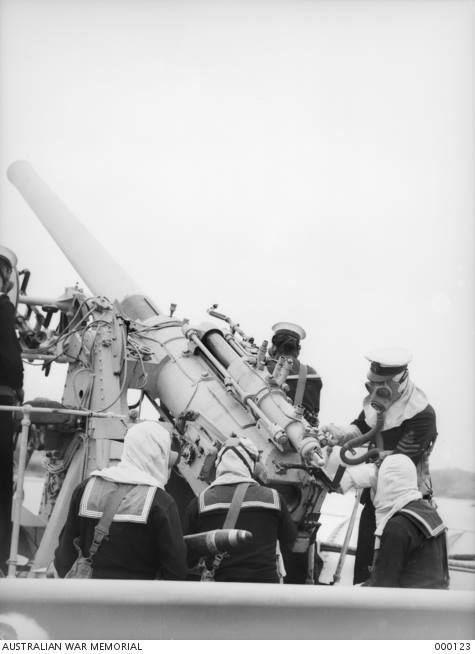 They were under constant threat from enemy fire from ships, submarines, aircraft and mines. More than 400 Australian merchant mariners are known to have lost their lives in the line of duty, some aboard the hospital ship Centaur. Of the 332 people on board the ship, there were only 64 survivors who clung to debris for about 35 hours before being rescued. Today we remember those who served our country as part of the Merchant Navy, their sacrifices will never be forgotten. For more information please visitwww.ww2australia.gov.au/waratsea or www.dva.gov.au. Image: 1939 Guncrew of merchant servicemen in gas marks and fire helmets. AWM 000123. Over the past few years, Swamp Foxtail or Fountain Grass species have become increasingly popular in urban landscaping. However, these showy grasses are now emerging as an invasive bush weed due to their capacity to readily self seed and colonise sensitive areas by forming dense clumps that exclude all other plants. A hardy, tuft forming grass, ornamental Swamp Foxtail grasses exhibit a range of different growth heights with strappy, arching leaves and attractive feathery flowerheads in a range of purple, pink and red colours. They can be planted in a variety of soil types and create interesting linear textures and colours in landscaping, hence their widespread popularity. Unfortunately due to their invasive self seeding tendencies, these grasses are now spreading indiscriminately. Vigilant bush regenerator contractors and Bushcare volunteers are committed to controlling rogue grasses as they pop up more regularly in sensitive bushland reserves. However with so many Swamp Foxtail species planted on road edges, embankments and home gardens their spread continues unabated. The native Swamp Foxtail grass, Pennisetum alopecuroides has a scattered coastal distribution from tropical Queensland to southern New South Wales. This native species is very hard to distinguish from the Class 5 noxious weed Pennisetum setaceum which originates from NE Africa/SW Asia. P. setaceum is a vigorous seeder and may already have been mistakenly sold as its native counterpart. It is also questionable as to how ‘native’ P. alopecuroides may be. Consequently it is not advisable to purchase or plant any of these grass species due to their invasive seeding capability. The irony is that there are so many fantastic native tussock grass alternatives such as Kangaroo Grass (Themeda australis), Barbed wire grass (Cymbopogon australis) or Sedges such as Carex appressa. They thrive in moister soils and in a landscaping context can be mass planted along with a range of Flax Lily (Dianella spp.) and some robust Lomandra to great effect. Another alternative is to plant native vines as ground covers. Vines such as Morinda jasminoides, Cissus hypoglauca, Gum vine (Aphanopetalum resinosum), Hibbertia scandens and Marsdenia suaveolens proffer the added bonus of sweet smelling flowers and interesting fruits that can also attract a variety of native fauna. Council is committed to controlling these weedy Swamp Foxtail grasses before they become established in our bushland reserves. These grasses, along with other invasive plant species are highlighted in the undesirable plant list available atwww.pittwater.nsw.gov.au/environment/species_lists to discourage their presence in landscaping of new developments. If you are aware of these grasses spreading in or adjacent to bushland areas or would like additional information about native plant species please contact Council’s Noxious Weed Officer on 9970 1364. Katandra opens to the public every Sunday in July, August, September and October 10am - 4pm. New Trustee appointments The Lands Department has appointed a new Trust for the next 5 years which includes three of the current trustees: Jenny Talbot, Lyn McDougall and David Seymour; and four new trustees: David James, Lachlan Laurie, Marita Macrae and Tim Thurston. Many thanks to the outgoing trustees, Margaret Seymour, John Gale, Ros Andrews and Garry Hewitt. Northern Beaches’ residents are invited to share their historical pictures of flood or storm related events throughout September. Local Councils (Manly, Pittwater and Warringah) are working closely with the SES to build community awareness around the risks of floods and coastal storms on the Northern Beaches and encourage households and businesses to prepare for such events. Submissions of these historical flood and storm related pictures will be used to build an exhibition of images that can be displayed during the summer vacation period 2014/15. In 2012, the Pittwater Council Climate Change Risk Assessment identified floods and coastal erosion would increase as a result of more frequent and intense storm activity combined with sea level rise. Further information on submission details will be launched to coincide with StormSafe Week (8-15 September 2014) and History Week (6-14 September). A Whistling Kite was found dead at the ferry wharf at Palm Beach on 19 August. 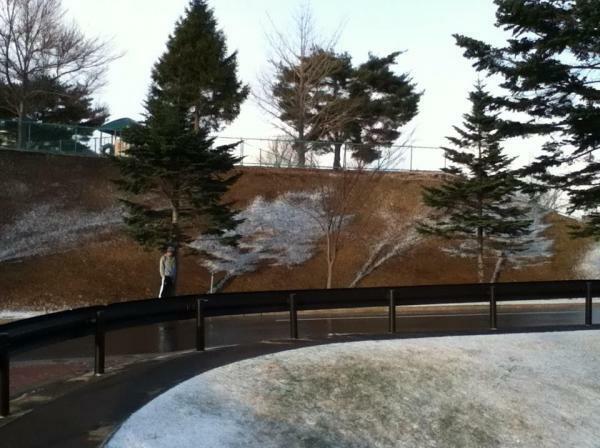 It appeared to be perfectly intact with no obvious signs of any damage by animal or car. Pittwater Council is looking to ascertain the cause of death and if possible taxidermy the species for use in educational purposes. To see this bird up close is pretty amazing, it’s comparative size, larger than you would think and the detail of its flight feathers, talons and beak. People who frequent the area have said there has been a pair of Whistling Kites in this location for a while but why it has died is not clear at this stage. Have you noticed myna birds invading your neighbourhood? Do you want to do something about them? The Pittwater Natural Heritage Association is seeking expressions of interest from members who would like to be involved in setting up a Pittwater Myna Control Group. There are a number of strategies that can be employed to control the spread of these pests and a number of towns and cities around Australia have been able to reduce the numbers of myna birds in their localities. Calling all Landcare and Bushcare Groups! Did you know that Landcare NSW provides a space for individual Landcare and Bushcare groups to have their own webpage? You can use the page to provide information on your group, share photos and provide updates on current works. It’s a great way to show the rest of the New South Wales, Australia and even the world all the amazing work you do. The Australian Bush Flower Essences (floral essences) are a system of healing that anyone can use for themselves or prescribe for others. Developed and researched by Naturopath, Ian White, a fifth generation Australian herbalist, the Bush Remedies not only help to give clarity to one's life but also the courage, strength and commitment to follow and pursue one's goals and dreams. On 1 August 2014 a new set of rules (called the 10/50 Rule) to do with vegetation removal came into force in NSW. Although intended for the public to "fire proof" their homes, its implementation goes far wider than that with very worrying consequences for the environment. Essentially, the rules permit homeowners in areas declared suitable for clearing to cut down any trees within 10 metres of any building with habitable rooms or remove understory vegetation within 50 metres. This applies in rural or urban areas. 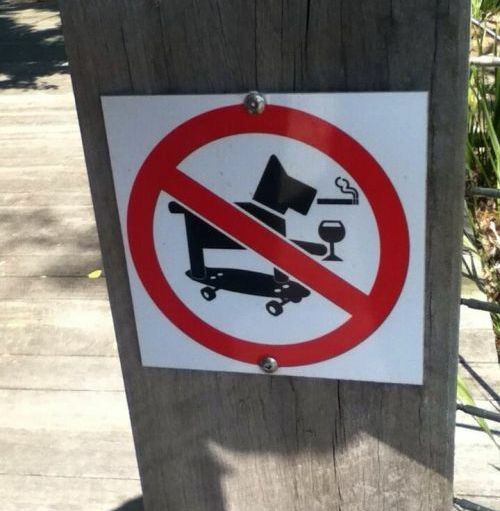 Owners do not have to seek any approval if they comply with a Code of Conduct. Areas declared suitable do not take into account any threatened species or endangered ecological communities. One of the major problems is that there are no publicly available maps of the areas suitable for the Rule. The only way to find out is to use an online tool, one address at a time. In a random search of Hawks Nest and Tea Gardens I found that the whole of both towns appear to be "suitable"! Great Lakes Council and the local RFS brigades were not consulted on suitable areas before the rules were activated. This rule could have a devastating effect on wildlife all over NSW and our Hawks Nest/Tea Gardens "endangered" koala population in particular. Homeowners in our urban area with a small (no more than 22) koala population could devastate koala habitat by removing virtually all trees without even having to consult the local Council. The Myall Koala and Environment Group is seeking to have the new rules suspended until proper consultation is initiated with local authorities with a view to correctly identifying the severity of bush fire threat and taking threatened species into account. 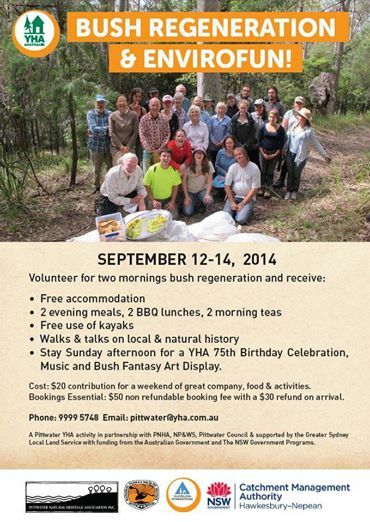 Pittwater Council is joining forces with Pittwater YHA’s Bush Regeneration Weekend for Bushcare’s Major Day Out on Sunday 14 September. Join us for a morning of bush regeneration at beautiful Lovett Bay, a great morning tea, and YHA’s 75th anniversary celebrations during the afternoon! Bushcare’s Major Day Out is a national day designed to encourage us all to take part in the restoration and maintenance of our remaining bushland, and is fast becoming a popular annual event. When: Sunday 14 September. 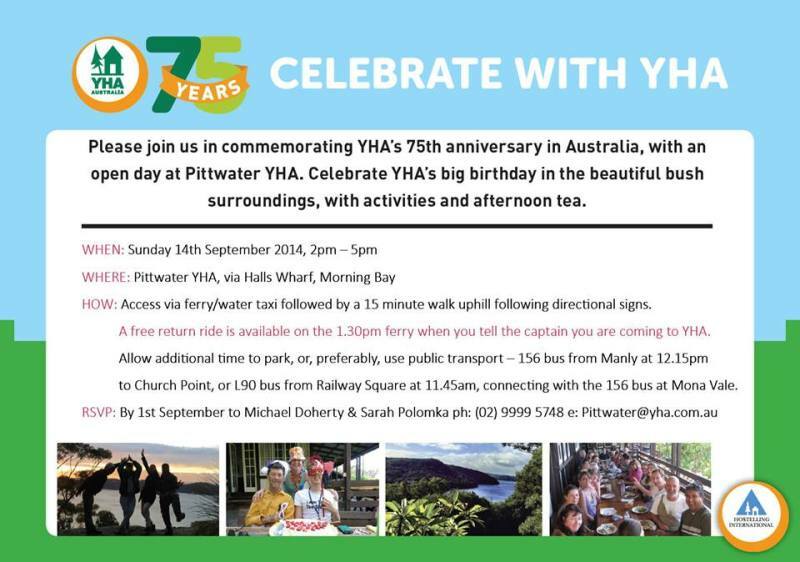 Meet at Church Point ferry wharf prior to ferry departure at 8:30am – Bushcare Major Day Out starts at 9am at Pittwater YHA. Cost: Free. RSVP essential for free return ferry to the event. What to wear and bring: Sturdy comfortable shoes, long sleeves and trousers, hat and drinking water. For more information or to RSVP for a free ferry ride, contact Pittwater Council’s Bushcare Officer on 9970 1367 or emailbushcare@pittwater.nsw.gov.au. Come along to the Streamwatch Spring Water Bug Watch in September. Spring is a great time to get out there and look for water bugs, they are a great indicator of the health of our creeks and streams. Join us for this family friendly morning to learn more about the amazing creatures that live in our creek lines and waterways and take a tour of the wetlands. In September the Australian Museum is supporting groups across Sydney in looking for water bugs as part of the “Water Bug Watch”. Become part of the Pittwater Council and Australian Museums volunteer Streamwatch water monitoring groups and help us to keep our creeks and rivers healthy. Where: Irrawong Reserve. Meet at the entrance to Irrawong Reserve at the end of Irrawong Road, North Narrabeen. Are you new to Bushcare in Pittwater or thinking about getting involved? Or are you simply looking for some skills and techniques for identifying and removing weeds from your backyard? If you answered ‘Yes’ then this is an essential workshop to learn the tips, tricks and identification skills to conduct bush regeneration work in our local reserves or your native garden. The workshop will be split into two components, a theory session and a field trip to nearby bushland. In the theory session participants will be guided through a provided booklet in order to learn some of the most common weeds and native plants, including those extra tricky ‘look-a-like plants’. Some live samples of plants will help aid the learning process. Correct removal techniques for specific weeds will also be shown, along with some of the core principles of bush regeneration and conducting safe work practices in the bush. The field trip will put this newly found knowledge into practice, identifying natives and weeds in a bushland setting, and discussing strategies for managing weed infested areas. Learn the secrets of successful grant writing! This workshop is for anyone interested in securing funding for community based projects. Hear from community groups who have been successful and take advantage of helpful advice from our expert presenter. We will also touch on alternatives to traditional grants such as crowd funding and time banking! Sunday 12 October – 2 sessions: 9am – 12noon or 1 – 4pm. Please book for one session only. Do you want to learn more about Native Bees? Pittwater Council will hold two free half-day workshops on native bees and how to keep them. Native bees are a fantastic part of our environment and are very seldom seen. Native bee expert, Tim Heard will be presenting his very popular workshop on keeping native bees. Learn more about how these communities of native bees live, breed and forage for food. Find out how and what they pollinate in your garden and what you need to do, grow and avoid in your garden to ensure a healthy hive. Can you tell the difference between a fruit fly and stingless bee? You will learn how to identify one from the other and keep native bees as well as how to extract honey from the hives. Mornings are a great time to take in some of the bountiful birdlife that makes Pittwater its home. Join us for a fantastic guided walk to learn more about our feathered friends. Our birding mornings are guided by local experts and are a great opportunity to get a better look at our local bird life. A great activity for those people interested to learn more as well as passionate birdwatchers. It’s a great morning out for everyone! We’re inviting local residents to join us on a walk through one of Pittwater’s spectacular reserves. This walk takes you through Pittwater’s largest continuous piece of bushland which contains many beautiful plant communities and threatened fauna. After the spring rains it is an outstanding time to experience our bushland come alive with wildlife and flowering plants. The walk is 1.5km one-way and is a little steep in parts, so although we will be taking it at a gentle pace a reasonable level of fitness is required. Bring a pair of walking shoes, snacks, water and sense of adventure! Frogs are some of our most secretive and sensitive water creatures. Come and learn more about our local frogs and how important they are for telling us the level of health of our creeks and wetlands. Pittwater Council will be hosting a workshop with frog expert Dr. Arthur White. This workshop includes an information session followed by a tour of a local wetlands site. We will use spotlights and listening to frog calls to identify our local froggy friends. It’s a great adventure for all the family. Children must be over eight years of age and accompanied by an adult. Bring a torch, a headlamp (optional) and walking shoes. We live in an area that has such a variety of natural beauty however, it’s also home to many snakes and spiders. Learn more about these creatures at our upcoming seminar on snake and spider awareness. This is a fantastic free activity and a great opportunity for the whole family to learn more about these amazing creatures. Come and join us on a low-tide rock platform tour. Once the ocean retreats an amazing world becomes uncovered for us to enjoy. Investigate the amazing diversity of life that lives between the land and the sea and how these creatures survive in such a unique and challenging environment. Sea stars, sea hares, limpets and crabs are some of the amazing creatures that call these rock platforms home. The tour is a great opportunity to learn about the amazingly abundant life that exists in these special places. Guided by local experts it’s a great way to learn about a world that is rarely seen. An amazing adventure for all the family! Where: Meet point provided on booking. What to bring: sturdy covered shoes that can get wet, hat, sunscreen, water, camera (optional) Bookings Essential! The Great Forest National Park is a proposed Australian national park designed to conserve and protect Melbourne's water supply, save the endangered Leadbeaters Possum, help protect against devastating bushfire and transform the environment into a high profile tourism region. The Great Forests National Park proposal is a vision for a multi-tiered parks system for bush users and bush lovers alike. It is a Parks system that protects and maintains important ecosystem functions critical for our way of life. The tallest flowering trees on Earth grow north-east of Melbourne. In their high canopies dwell owls, gliders and the tiny Leadbeater's (or Fairy) Possum. Victoria's precious and endangered faunal emblem lives only in these ash forests of the Central Highlands. Montane ash forests flourish along the Great Divide receiving high rainfall. They harvest water from the air and provide most of Melbourne's drinking water. Research has shown these forests to be among the most carbon-dense forests on Earth due to their rapid growth and relatively slow rates of decay in the cool, wet climate. The Park, stretching from Kinglake through to the Baw Baws and north-east up to Eildon, will host a range of activities such as bike riding, bushwalking, fishing, bird watching, four-wheel driving, motor biking, camping, zipline tours and much more. Are you interested in outdoor volunteer work that helps protect the Aboriginal heritage sites in your local area? Do you want to learn more about the heritage and history of Northern Sydney? If so, the Aboriginal Heritage Office (AHO) is starting a new round of volunteer training that is right up your alley. What is the Aboriginal Heritage Office? The AHO is a joint initiative by the City of Ryde, Ku-ring-gai, Lane Cove, Manly, North Sydney, Pittwater, Warringah and Willoughby councils, in a progressive move to protect Aboriginal Heritage in these areas. There are over 1000 Aboriginal heritage sites in Northern Sydney. This wealth of history provides us with one of the very few links that we have to this area’s indigenous past. The AHO monitors, records and protects these sites as well as educates our community and younger generation in the importance of indigenous heritage protection. What is a Volunteer Site Monitor? Becoming a Volunteer Site Monitor is a great way to learn about how Aboriginal people would have lived in this area. Volunteers are allocated a heritage site that they then monitor for any change, damage or potential harm. Sites are allocated to suit individual’s location, fitness and transport arrangements. Volunteers can monitor their allocated site at any time that suits them and there is no minimum requirement for the number of visits (with an aim to have sites monitored at least every six months). Participants of all professions, fitness levels and background knowledge are welcome. How do I become a Volunteer Site Monitor? New volunteers attend a short, two hour training session which gives an interesting insight into the history and heritage of northern Sydney as well as providing information about how to carry out the role of a Volunteer Site Monitor. The IUCN World Parks Congress 2014 is a landmark global forum on parks and protected areas held once every 10 years. The Congress will be hosted in Sydney, Australia from 12 – 19 November 2014, on the theme Parks, Planet, People: inspiring solutions. The Congress program consists of eight concurrent streams which are Reaching Conservation Goals, Responding to Climate Change, Improving Health and Well-being, Supporting Human Life, Reconciling Development Challenges, Enhancing Diversity & Quality of Governance, Respecting Indigenous & Traditional Knowledge and Culture and Inspiring a New Generation. One stream alone, the Improving Health and Wellbeing: Healthy Parks Healthy People will have over 150 speakers from around the world will contribute and between 3000 to 5000 delegates are expected to attend this very significant Congress. You will benefit from their expertise, practical lessons learnt and plans for positive change. Attendees will range from world leaders in environment, health, tourism, education and urban planning fields and more, to young people with a passion and interest in creating a better future. As well as an incredibly informative week-long program there will be opportunities to network at social events, field trips around Sydney and Australia, and opportunities to be involved in groups taking specific action after the Congress to deliver on commitments for positive change. Tasmania’s anti-conservationist Government has passed a bill that will see rainforest protection threatened, the ongoing logging of unique native forests, continued prop up of an industry crisis and the appalling relationship with corrupt Sarawak timber barons. The global community will be alerted to what is happening here in Tasmania's forests. International markets are receiving contentious timber, the government has delivered iconic rainforest and wilderness forests to the loggers and Forestry Tasmania who is still bleeding the taxpayer purse is seeking FSC that they should not receive”. “At the helm over the unique forests in Tasmania is a Government that has legislated for the ongoing logging of wildlife habitat of quolls, wedge tailed eagles, Tasmanian devils and swift parrots. “Ancient rainforests across Tasmania have been opened for logging, because this bill provides for 1.1 million hectares of long-standing reserves across Tasmania for ‘specialty’ species logging”. “The Government have trashed the legacy of previous Liberal Prime Minister John Howard in the Tarkine by opening rain forests for 'specialty' timber logging. In 2004 Prime Minister John Howard won an election in which he promised large tracts of the Tarkine rainforests would be protected from logging. He made good that promise and rainforest logging was ended in significant tracts of the Tarkine. Now Howard's protection has been shattered and the Tarkine rainforest, outside the fraction in national park, is open to future logging,” Jenny Weber said. “The future of Tasmania’s unique forests is appalling under this anti-conservation government, in the past years financial support for the logging industry flowed, including hundreds of millions of dollars to continue native forest destruction,” Jenny Weber said. September 2, 2014 - The gravity of the world's current extinction rate becomes clearer upon knowing what it was before people came along. A new estimate finds that species die off as much as 1,000 times more frequently nowadays than they used to. That's 10 times worse than the old estimate of 100 times. It's hard to comprehend how bad the current rate of species extinction around the world has become without knowing what it was before people came along. The newest estimate is that the pre-human rate was 10 times lower than scientists had thought, which means that the current level is 10 times worse. Extinctions are about 1,000 times more frequent now than in the 60 million years before people came along. The explanation from lead author Jurriaan de Vos, a Brown University postdoctoral researcher, senior author Stuart Pimm, a Duke University professor, and their team appears online in the journalConservation Biology. "This reinforces the urgency to conserve what is left and to try to reduce our impacts," said de Vos, who began the work while at the University of Zurich. "It was very, very different before humans entered the scene." In absolute, albeit rough, terms the paper calculates a "normal background rate" of extinction of 0.1 extinctions per million species per year. That revises the figure of 1 extinction per million species per year that Pimm estimated in prior work in the 1990s. By contrast, the current extinction rate is more on the order of 100 extinctions per million species per year. Orders of magnitude, rather than precise numbers are about the best any method can do for a global extinction rate, de Vos said. "That's just being honest about the uncertainty there is in these type of analyses." The new estimate improves markedly on prior ones mostly because it goes beyond the fossil record. Fossils are helpful sources of information, but their shortcomings include disproportionate representation of hard-bodied sea animals and the problem that they often only allow identification of the animal or plant's genus, but not its exact species. What the fossils do show clearly is that apart from a few cataclysms over geological periods -- such as the one that eliminated the dinosaurs -- biodiversity has slowly increased. The new study next examined evidence from the evolutionary family trees -- phylogenies -- of numerous plant and animal species. Phylogenies, constructed by studying DNA, trace how groups of species have changed over time, adding new genetic lineages and losing unsuccessful ones. They provide rich details of how species have diversified over time. "The diversification rate is the speciation rate minus the extinction rate," said co-author Lucas Joppa, a scientist at Microsoft Research in Redmond, Wash. "The total number of species on earth has not been declining in recent geological history. It is either constant or increasing. Therefore, the average rate at which groups grew in their numbers of species must have been similar to or higher than the rate at which other groups lost species through extinction." For a third approach, de Vos noted that the exponential climb of species diversity should take a steeper upward turn in the current era because the newest species haven't gone extinct yet. "It's rather like your bank account on the day you get paid," he said. "It gets a burst of funds -- akin to new species -- that will quickly become extinct as you pay your bills." By comparing that rise of the number of species from the as-yet unchecked speciation rate with the historical trend (it was "log-linear") evident in the phylogenies, he could therefore create a predictive model of what the counteracting historical extinction rate must have been. There is little doubt among the scientists that humans are not merely witnesses to the current elevated extinction rate. This paper follows a recent one in Science, authored by Pimm, Joppa, and other colleagues, that tracks where species are threatened or confined to small ranges around the globe. In most cases, the main cause of extinctions is human population growth and per capita consumption, although the paper also notes how humans have been able to promote conservation. "We've known for 20 years that current rates of species extinctions are exceptionally high," said Pimm, president of the conservation nonprofit organization SavingSpecies. "This new study comes up with a better estimate of the normal background rate -- how fast species would go extinct were it not for human actions. It's lower than we thought, meaning that the current extinction crisis is much worse by comparison." Vintage engraving of the Dodo (Raphus cucullatus), a flightless bird endemic to the Indian Ocean island of Mauritius. 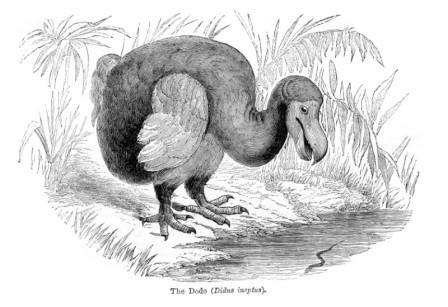 The dodo has been extinct since the mid-to-late 17th century. Thanks to the efforts of the community and media, the plight of a Little Penguin that went missing at Manly Wharf last Thursday has been revealed with the animal sadly succumbing to its injuries over the weekend. The National Parks and Wildlife Service (NPWS) Little Penguin Co-ordinator, Ranger Melanie Tyas said it was disappointing that the bird did not survive. “The past few days have really shown how much Sydneysiders care about their Little Penguins and we’d like to thank the community and media for all their assistance,” Ms Tyas said. “We now know that the bird had been attacked by a natural predator, possibly a small shark, when it was found and taken by a concerned local to a vet who unfortunately could not save it. “We always feared it would not survive the injuries that it was reportedly carrying so while it is not surprising, it is always disappointing. “NPWS will now collect the penguin so that it can be identified via its microchip and provided to Taronga Zoo for assessment. “We are very lucky to have such an active and interested community working together to protect and report on the local Little Penguin population including the volunteer penguin wardens, Manly Council, local vets and many others in the community. “I suppose this unfortunate incident highlights that if anyone finds a sick or injured penguin, put it in a box and keep it warm and notify NPWS or Taronga as soon as possible." NPWS said that last year was the most successful breeding season on record, so we are very excited about the future of this colony. Sydneysiders should report all sick and injured Little Penguins to NPWS duty officer on 9457-9577. The beauty of the Gwydir Wetlands Nature Reserve is being captured by local artists in a collaboration with the Office of Environment and Heritage. 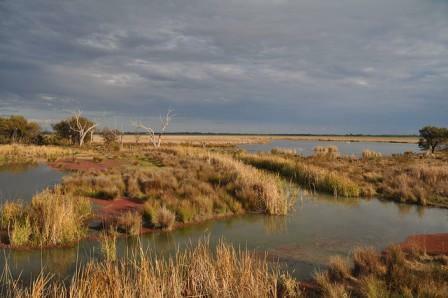 Local artist Ned McDowell recently visited the Gwydir to capture the splendour of this western floodplain ecosystem. He and local photographer Mel Arnott will produce a body of artwork for exhibition at various regional galleries during 2015. Ned explores his surrounds with an expressionist approach, working mostly in acrylic on paper. He has held successful exhibitions of his works in Moree and Armidale. In response to the floods of 2011/12, coupled with a program of prudent water management, the wetlands now flourish and have built in vigour. This upcoming growing season will again see a proactive watering resulting in a substantial wetland area inundated. OEH Senior Wetlands Conservation Officer Daryl Albertson said the Gwydir existed as a series of zones, not just wet areas. “We therefore anticipate there will be great variety in the photographs and paintings Ned and Mel will produce, because the intermediate and drier red ridge areas are seldom flooded,” Mr Albertson said. “Each zone of the Gwydir has its own peculiar community, displaying a wealth of character and form. We will show Ned and Mel these unique areas, discuss their nature and function and observe their artistic responses,” he said. One hundred years after they arrived in a sack of grain, white Italian snails are the target of beleaguered South Australian farmers who have joined forces with University of Sydney robotics experts to eradicate the gastropods. Now numbered in their billions, the white Italian snail is causing immeasurable damage to broadacre crops across Australia's southern states forcing farmers off their land. Dr Robert Fitch, Senior Research Fellow at the University 's Australian Centre for Field Robotics is working with farmers and agronomists in the region on new methods for reversing the plague of slimy molluscs. To date, traditional methods of burning or poisoning the snails have failed to halt their advance and robotics is set to "transform the way food is grown, produced and delivered". "We are investigating ways of using robots such as the newly built Ladybird, to count or locate where and when the snails are likely to be on the move," Dr Fitch says. "Once farmers know more about the behaviour patterns of the snails they can apply the most appropriate methods to ridding their property of the pests. "The farm of the future will likely involve a 'system of systems ' where teams of relatively small robots and sensors work together to collect information and perform mechanical tasks." Sarah Noack, a research and extension manager for the Hart Field-Site Group in SA, agrees snails cause significant problems to farmers and says the prospect of new ways of tracking and controlling them is an exciting development for the industry. "Snails cause damage to emerging crops, can clog machinery at harvest and contaminate grain resulting in delays and frustration," she says. "Controlling snail populations is vital if grain contamination and crop damage are to be prevented. This means monitoring and managing snails regularly throughout the year. "We know that they eat green plant material and dead organic material and can cause significant damage to emerging crops pastures. In the summer they also cling to the stems of plants keeping cool off the ground." Field research estimates that each snail lays 400 eggs per year and if the environmental conditions are conducive, hundreds more. Dr Robert Fitch is the special guest speaker at this year 's Hart Field Day on Tuesday, September 16. Nature lovers from across the world are invited to submit photos for a photography competition to showcase the beauty and importance of national parks. Environment Minister Rob Stokes said the competition is a celebration of the crucial role national parks play in sustaining the health of our planet. The photos will be on exhibition during the IUCN World Parks Congress in Sydney during November. "The Saved photography competition encourages professional and amateur photographers, as well as Instagram lovers, to get out and about in our national parks and start snapping,” Rob Stokes said. “NSW has some of the most diverse and awe-inspiring landscapes in the world. We are surrounded by beaches, wilderness and world heritage areas. • Planet: images and stories about the sustainable use of natural resources in protected areas including the conservation of habitats and species. Entries are due by 30 September and the winning pictures will be on display at the IUCN World Parks Congress to be held from 12 - 19 November in Sydney. Fondly referred to as "Nature's Olympics" the event will bring together 160 countries and global experts from organisations including UNESCO, the United Nations Environment Program and the Intergovernmental Panel on Climate Change. September 2, 2014 - Thriving economies are the biggest factor in the disappearance of minority languages and conservation should focus on the most developed countries where languages are vanishing the fastest, finds a new study. New research shows economic growth to be main driver of language extinction and reveals global ‘hotspots’ where languages are most under threat. The study’s authors urge for “immediate attention” to be paid to hotspots in the most developed countries – such as north Australia and the north-western corners of the US and Canada – where conservation efforts should be focused. The study is published today in the journal Proceedings of Royal Society B. The three main risk components are: small population size (small number of speakers), small geographical habitat range and population change – in this case, the decline in speaker numbers. By interrogating huge language datasets using these conservation mechanisms, the researchers found that levels of GDP (Gross Domestic Product) per capita correlated with the loss of language diversity: the more successful economically, the more rapidly language diversity was disappearing. “As economies develop, one language often comes to dominate a nation’s political and educational spheres. People are forced to adopt the dominant language or risked being left out in the cold – economically and politically,” said Dr Tatsuya Amato, from the University of Cambridge’s Department of Zoology. In the northwest corner of North America, the languages of the indigenous people are disappearing at an alarming rate. Upper Tanana, for example, a language spoken by indigenous Athabaskan people in eastern Alaska, had only 24 active speakers as of 2009, and was no longer being acquired by children. The Wichita language of the Plains Indians, now based in Oklahoma, had just one fluent speaker as of 2008. As the researchers point out, “languages are now rapidly being lost at a rate of extinction exceeding the well-known catastrophic loss of biodiversity”. Major international organisations such as the United Nations and Worldwide Fund for Nature are now actively engaged in the conservation of linguistic diversity. Amano says the global meta-analysis produced by the team using the species criteria is designed to complement the more specific, localised examples featured in many linguistic and anthropological research. Researchers from the University of Sydney's Charles Perkins Centre have joined forces with Taronga Zoo for a world-first study on the eating habits of endangered Tasmanian devils and fat-tailed dunnarts. It is hoped the study will allow zookeepers to design diets that boost captive breeding programs to help save the Tasmanian devils and other carnivorous marsupials from extinction. Understanding the animals' own food choices at different life stages will allow researchers to purpose build diets to support breeding, said Professor David Raubenheimer, lead researcher on the study. "We are allowing dunnarts to manipulate their own diets, and measuring the overall diet they target when faced with foods that vary in nutritional composition, as is the case in the wild," said Professor Raubenheimer, Leonard P Ullmann Chair of Nutritional Ecology at the Charles Perkins Centre and a Professor in the University's Faculty of Veterinary Science and School of Biological Sciences. "Once we have a good understanding of the nutritional processes underlying the animals' optimum diets, we'll be in a position to manipulate them to regulate their nutrition in a way that achieves the desired outcomes for captive breeding programs. "Ultimately it's about obtaining a deeper understanding of carnivore nutrition, an understanding that then can be used in managing captive carnivores for conservation purposes," Professor Raubenheimer said. The study is the world's first to measure how wild predators regulate their intake of protein, fats and carbohydrates to manage breeding, and uses an innovative nutritional geometry approach. Pioneered by Charles Perkins Centre researchers, nutritional geometry provides a framework to model the effects of nutrients on food choice and food intake, and in turn how their diet influences development, health and reproduction. The approach has been used to analyse the feeding behaviours of many species, including pandas, mice, dogs and cats, locusts, flies, spider monkeys, gorillas, grizzly bears and humans. September 3, 2014 - New research has found that malicious behavior is the norm in crowdsourcing competitions - even when it is in everyone’s interest to cooperate. Crowdsourcing provides the ability to accomplish information-gathering tasks that require the involvement of a large number of people, often across wide-spread geographies, expertise, or interests. However, researchers from the University of Southampton and the National Information and Communications Technology Australia (NICTA) found that a significant feature of crowdsourcing - its openness of entry - makes it vulnerable to malicious behaviour. They observed such behaviour in a number of recent popular crowdsourcing competitions, through analysis based on the 'Prisoner's Dilemma' scenario, which shows why two purely 'rational' individuals might not cooperate, even if it appears that it is in their best interest. Co-author Dr Victor Naroditskiy from the University of Southampton says: "Everyone from the 'crowd' can contribute to solving the task. This is exactly what makes crowdsourcing so powerful for solving tasks that are all but impossible for a closed group of individuals or an organisation. "At the same time, the openness makes crowdsourcing solutions vulnerable to malicious behaviour of other interested parties. Malicious behaviour can take many forms, ranging from sabotaging problem progress to submitting misinformation. This comes to the front in crowdsourcing contests where a single winner takes the prize." Surprisingly, making the attacks more expensive for the attacker is not an effective way of deterring them. These findings, published in the Journal of the Royal Society Interface, will be important for the design of crowdsourcing competitions, as well as for firms that consider using a crowdsourcing to solve a task. Dogs provided with the best living conditions and kinder training methods are giving the best results in the workplace, according to a new study of farm dogs from the University of Sydney's Faculty of Veterinary Science. "The new findings serve as a guide to ways of optimising working dog performance and welfare," says one of the study's authors Professor Paul McGreevy. The study, recently published in PLOS, shows that handlers who use electric shock collars report less success in training than those who use positive reinforcement. Positive reinforcement for dogs can include food rewards, verbal praise, physical contact and play. The results reflect data on over 4000 dogs. Associations were identified between success rate and seven variables: dog breed, housing method, trial participation, age of the dog at acquisition, hypothetical maximum treatment expenditure and the conscientiousness score of the owner's personality. Although the study focuses on farm dogs, the insights also have potential relevance to companion dogs and those dogs working in other contexts. For example, it reported that success rate was positively associated with how often dogs exercised. "The role of conscientiousness in handlers is particularly interesting as it is relevant to the best handling and training methods," Professor McGreevy said. "We know that good animal training is underpinned by consistency and timing." So, handlers who are consistent give clearer commands while those with good timing can, for example, allow their dogs to make the strongest association between behaviour and the appearance of rewards. Although low numbers of handlers appear to be using electric shock collars, the risks to dog welfare are significant, especially in the hands of less accomplished trainers. There is evidence that these devices can make dogs withdrawn and less likely to work well. Bad timing can create highly undesirable associations with aspects of the dog's surroundings, including people. "Previous studies have shown that trainers with lower levels of education are more likely to use harsh training methods, such as these," Professor McGreevy said. "The results emphasise the importance of not only examining the genetic predispositions of the working dog but also the impact the handler can have on a dog's success in the workplace." The results were acquired through The Farm Dog Survey, as part of an ongoing project with the Rural Industries Research and Development Corporation, Meat and Livestock Australia and the Working Kelpie Council of Australia. The University of Sydney announces a special evening to celebrate the life and music of Peter Sculthorpe AO OBE, Australia's most revered composer of the 20th century. The free public performance will be presented by Sydney Conservatorium of Music and its students on Saturday 25 October 2014 from 7pm. The gala event will be held in honour and celebration of the Emeritus Professor's immense, life-long contribution to music in this country, and the 51 years of his life that he devoted to the University of Sydney. "Peter Sculthorpe is one of those extraordinary artists whose immeasurable impact on music will become more and more apparent in years to come.& The concert will give us a glimpse of the legacy of this gifted musician, as we again take enormous pleasure in listening to his most cherished works," said Dr Michael Spence, Vice Chancellor, The University of Sydney. Performances of three signature works written by the composer: Kakadu (1988), the Burke & Wills Suite (1986) and Canticle V will be presented by the Sydney Conservatorium of Music's Symphony Orchestra, Wind Symphony and Chamber Choir. Marking the celebration, four colleagues and former students of Sculthorpe, ProfessorAnne BoydAM,Professor Matthew Hindson AM, Dr Ross Edwards AM and Kim Williams AM, will give personal reminiscences. "Rarely is it given to a single individual to inscribe the soul of a nation in their musical utterance. As a passionate Australian seeking the spiritual in nature, such has been Peter's contribution to Australian culture as will be heard in the music performed in this concert," said Professor Boyd. Peter Sculthorpe first came to the University of Sydney in 1963 at the invitation of Professor Donald Peart to take up an appointment as Lecturer in Music in the Faculty of Arts' Department of Music. His first teaching was in ethnomusicology, stimulating a lifelong interest in the musical traditions of Asia, of Japan and Bali in particular. He inflected all his teaching towards composition, nurturing generations of young composers. He was promoted to a personal Chair in Musical Composition within the Faculty of Arts in 1991 and played a significant role in bringing the Sydney Conservatorium of Music into the University. In 2005 he became an Emeritus Professor of Composition at the University of Sydney, and continued to support and inspire music students in the final years of his life. Peter Sculthorpe passed away earlier this month at the age of 85. The Peter Sculthorpe concert at the Sydney Conservatorium of Music is a free event, however tickets are required. Registration is essential and is available online at http://music.sydney.edu.au from Wednesday 1 October 2014 with a limit of two tickets per person. September 2, 2014 - Exercising each day can help keep the doctor away. In a new study reported in the American Heart Association journal Circulation: Heart Failure, researchers say more than an hour of moderate or half an hour of vigorous exercise per day may lower your risk of heart failure by 46 percent. Heart failure is a common, disabling disease that accounts for about 2 percent of total healthcare costs in industrialized countries. Risk of death within five years of diagnosis is 30 percent to 50 percent, researchers said. Swedish researchers studied 39,805 people 20-90 years old who didn't have heart failure when the study began in 1997. Researchers assessed their total- and leisure time activity at the beginning of the study and followed them to see how this was related to their subsequent risk of developing heart failure. They found that the more active a person, the lower their risk for heart failure. The group with the highest leisure time activity (more than one hour of moderate or half an hour of vigorous physical activity a day) had a 46 percent lower risk of developing heart failure. Physical activity was equally beneficial for men and women. Those who developed heart failure were older, male, had lower levels of education, a higher body mass index and waist-hip ratio, and a history of heart attack, diabetes, high blood pressure and high cholesterol. "You do not need to run a marathon to gain the benefits of physical activity - even quite low levels of activity can give you positive effects," said Kasper Andersen, M.D., Ph.D., study co-author and researcher at the Uppsala University in Uppsala, Sweden. "Physical activity lowers many heart disease risk factors, which in turn lowers the risk of developing heart failure as well as other heart diseases." Study participants completed questionnaires that included information about lifestyle, physical activity, smoking and alcohol habits, and medication use. Researchers looked at total physical activity, which included job-related activities, and leisure activities. Participants' self-reported leisure physical activity was divided further into three categories: light, such as casual walking; moderate, such as jogging or swimming; and heavy, such as competitive sports. Diagnoses, hospitalizations and deaths were verified using participants' medical records. "The Western world promotes a sedentary lifestyle," Andersen said. "There are often no healthy alternative forms of transportation; in many buildings it is hard to find the stairs; and at home television and computers encourage sedentary behavior. "Making it easier and safer to walk, bicycle or take the stairs could make a big difference. Our research suggests that everyone could benefit from getting out there and moving every day." Although the relationship between heart failure and exercise has not been broadly studied, the study's findings reaffirm the importance of continued physical activity for all adults and support the American Heart Association's recommendations of 150 minutes of moderately intense physical activity every week. For those who need to lower their blood pressure and cholesterol the association recommends 40 minutes 3-4 times per week. September 2, 2014 - Among patients with morbid obesity, blocking the vagus nerve, which plays a role with appetite and metabolism, did not meet pre-specified efficacy objectives compared to a control group, although the intervention did result in greater weight loss, according to a study in the September 3 issue of JAMA. Bariatric surgery can produce significant weight loss and improvement in health but is associated with several potential adverse effects. There is interest in the development of a device that could be as effective or nearly as effective as bariatric surgery but has fewer risks and is less invasive. One such possibility is blockade of the vagus nerve using electrodes implanted through minimally invasive laparoscopic surgery, according to background information in the article. Sayeed Ikramuddin, M.D., of the University of Minnesota, Minneapolis, and colleagues randomly assigned 239 participants who had a body mass index of 40 to 45 or 35 to 40 and 1 or more obesity-related condition to receive an implanted active vagal nerve block device (n = 162) or an implanted sham (inactive) device (n = 77). All participants received weight management education. The study was conducted at 10 sites in the United States and Australia between May and December 2011. At 12 months in the intent-to-treat population, the average percentages of excess weight loss was 24.4 percent (9.2 percent of their initial body weight loss) in the vagal nerve block group and 15.9 percent (6.0 percent initial body weight loss) in the sham group, with an average difference of 8.5 percentage points, which did not meet the primary efficacy objective of achieving superiority with a 10 percentage-point margin. Weight loss was statistically greater in the vagal nerve block group. At 12 months, 52 percent of participants in the vagal nerve block group achieved at least 20 percent; and 38 percent, at least 25 percent of excess weight loss, which did not meet the primary efficacy objective performance goals of at least 55 percent of participants achieving a 20 percent excess weight loss and 45 percent achieving a 25 percent excess weight loss. The device, procedure, or therapy-related serious adverse event rate in the vagal nerve block group was 3.7 percent, significantly lower than the 15 percent primary safety objective goal. The adverse events more frequent in the vagal nerve block group were heartburn, indigestion and abdominal pain attributed to therapy; all were reported as mild or moderate in severity. "Additional studies are needed to compare effectiveness of vagal nerve block with other obesity treatments and to assess long¬term durability of weight loss and safety," the authors conclude. David E. Arterburn, M.D., M.P.H., of the Group Health Research Institute, Seattle, and David P. Fisher, M.D., of the Permanente Medical Group, Richmond, Calif., write in an accompanying editorial that several conclusions can be drawn from this study. "First, vagal nerve blockade plus moderately intensive lifestyle counseling does not appear to be much more effective than an intensive lifestyle program. Second, based on comparisons with other studies, procedures for adjustable gastric banding, which reported a 50 percent excess weight loss; Roux-en-Y gastric bypass, a 68 percent excess weight loss; and vertical sleeve gastrectomy, a 65 percent excess weight loss, are clearly more effective for initial weight loss than vagal nerve blockade. Third, the rate of serious adverse events with vagal nerve blockade (8.6 percent) is clinically important. Fourth, the long-term rates of weight regain and reoperation with vagal nerve blockade are currently unknown. Fifth, the report by Ikramuddin et al does not include a discussion of how vagal nerve blockade compares with other obesity treatments in terms of costs. Although vagal nerve blockade therapy is an innovative approach, it does not appear to be a sustained, effective treatment for severe obesity." September 2, 2014 - Among women diagnosed with early-stage breast cancer in California, the percentage undergoing a double mastectomy increased substantially between 1998 and 2011, although this procedure was not associated with a lower risk of death than breast-conserving surgery plus radiation, according to a study in the September 3 issue of JAMA. The authors did find that surgery for the removal of one breast was associated with a higher risk of death than the other options examined in the study. Randomized trials have demonstrated similar survival for patients with early-stage breast cancer treated with breast-conserving surgery and radiation or with mastectomy. However, previous data show increasing use of mastectomy, and particularly bilateral mastectomy (removal of both breasts) among U.S. patients with breast cancer. Evidence for a survival benefit with this procedure appears limited to rare patient subgroups. "Because bilateral mastectomy is an elective procedure for unilateral breast cancer [in one breast] and may have detrimental effects in terms of complications and associated costs as well as body image and sexual function, a better understanding of its use and outcomes is crucial to improving cancer care," according to background information in the article. Allison W. Kurian, M.D., M.Sc., of the Stanford University School of Medicine, Stanford, Calif., and colleagues used data from the California Cancer Registry from 1998 through 2011 to compare the use of and rate of death after bilateral mastectomy, breast-conserving therapy with radiation, and unilateral mastectomy (removal of one breast). Bilateral mastectomy was more often used by non-Hispanic white women, those with private insurance, and those who received care at a National Cancer Institute-designated cancer center; in contrast, unilateral mastectomy was more often used by racial/ethnic minorities and those with public/Medicaid insurance. Compared with breast-conserving surgery with radiation, bilateral mastectomy was not associated with a mortality difference, whereas unilateral mastectomy was associated with higher mortality. "In a time of increasing concern about overtreatment, the risk-benefit ratio of bilateral mastectomy warrants careful consideration and raises the larger question of how physicians and society should respond to a patient's preference for a morbid, costly intervention of dubious effectiveness," the authors write. "These results may inform decision-making about the surgical treatment of breast cancer." Editorial: Contralateral Prophylactic Mastectomy: Is It a Reasonable Option? In an accompanying editorial, Lisa A. Newman, M.D., M.P.H., of the University of Michigan, Ann Arbor, discusses the issues involved with the use of contralateral prophylactic mastectomy (risk-reducing mastectomy for the unaffected breast). "The need for patients to be accurately informed regarding safe and oncologically acceptable treatment options is indisputable. The dense fog of complex emotions that accompanies a new cancer diagnosis can impair the ability to process this information. Patients should be encouraged to allow the intensity of these immediate reactions to subside before committing to mastectomy prematurely. Physicians should not permit excessive treatment delays to compromise outcomes, but the initial few weeks surrounding the diagnosis are more effectively utilized by time invested in patient education and procedures that contribute to comprehensive treatment planning as opposed to hastily coordinating impulsive, irreversible surgical plans." Enter The Nature Conservancy Australia Nature Writing Prize today! Calling all nature writers. The Nature Conservancy Australia is delighted to open the third biennial Nature Writing Prize. The $5,000 award is for an essay between 3,000 and 5,000 words in the genre of ‘Writing of Place’ and the winning essay will be published in the Australian Book Review. The prize will go to an Australian writer whose entry is judged to be of the highest literary merit and which best explores his or her relationship and interaction with some aspect of the Australian landscape. The competition’s judges are Jesse Blackadder, award-winning author of Chasing the Light and Paruku The Desert Brumby, and Robert Gray, renowned poet, critic, and freelance writer. The prize has been made possible thanks to a generous donation from The McLean Foundation, which is keen to promote and celebrate the literature of nature in Australia. The deadline for submissions is December 24, 2014, so get out your pens and start writing! Click here to learn more about the prize and review the terms and conditions for entering.